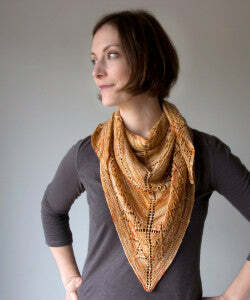 Another idea for a knitted gift when you're pressed for time: a triangular shawl. They look impressive, but you know, they can be done pretty quickly. Okay, let's back up a bit. Say you've decided at the last minute to knit something as a gift. Or, you just found out that a friend is giving you a present and you didn't buy them a present so you have to balance the universe. The question you're asking yourself: what can I get done in one night? A good way to think about it is in yardage (or meterage, if you prefer). Get to know your yarn-efficiency. A 50 gram ball of worsted is roughly about 110 yards. How long does it take you to finish a ball? I can knit a worsted weight hat in an evening, if it's not too complex. That's about 140 yards. So that's my per-evening yardage. 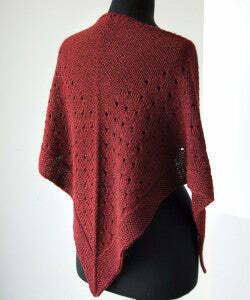 And getting back to the shawl idea, a shawl, like the ones in the Triangular Shawls booklet, takes about 400 yards. So theoretically, that's a 3-evening project. (Don't forget to leave time to wet block!) And bump up the yarn-weight to sport or DK, and you get an even bigger shawl with the same amount of knitting. Since it's still only the 10th, there's still time for 3-evening projects! take 5 or 10 minutes earlier in the day to find everything you might need—the pattern, stitch markers, needles, crochet hook, scissors, measuring tape, a pencil—and put it in your knitting area. keep track of rows and stitches as you go; it's easy to lose track of a pattern when you're rushing and ripping back a row or two takes up valuable time!